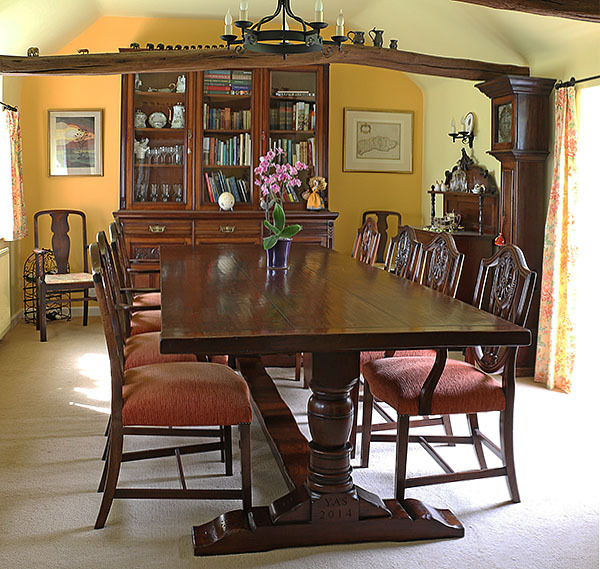 A period style oak pedestal dining table, personalised to our client, and pictured here in the converted forge of their Sussex cottage. From our Wilmington bespoke furniture range and specially made to 300cm x 107cm, the design of this particular piece was actually based on our semi-bespoke Berwick pedestal dining table. Our client visited our showroom and loved the example we have on display. To personalise the table, we carved the owners initials at each end. You can just see one set of initials and the date, here at the base of the turned pedestal support.